I was over by our Goodwill Outlet store on Friday and decided to venture in and buy some books to rip the covers off. All hardback books are 50 cents and they normally have quite a few old books. If you have never been in a Goodwill Outlet store it is quite an experience…one that I don’t repeat often! The good news is that all household items are 59 cents per pound. The bad news is the bins are full of broken glass and trash that you have to dig through. Not my idea of a fun time! 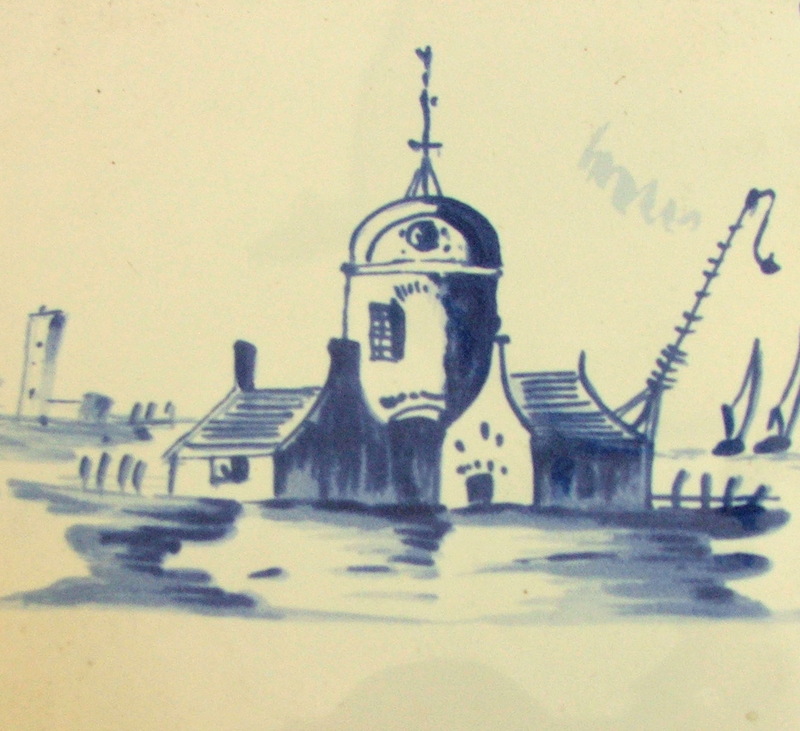 As soon as I walked into the outlet I saw five Delft tiles laying on one of the tables. If you have read my blog, even for two seconds, you know how much I love anything blue and white. I grabbed the tiles and started walking to the book section. something like this doing in GW? I ran frantically to the other side of the warehouse, grabbed my treasure and headed immediately to the cashier. I was so afraid someone would tell me it wasn’t for sale or that it was already spoken for. 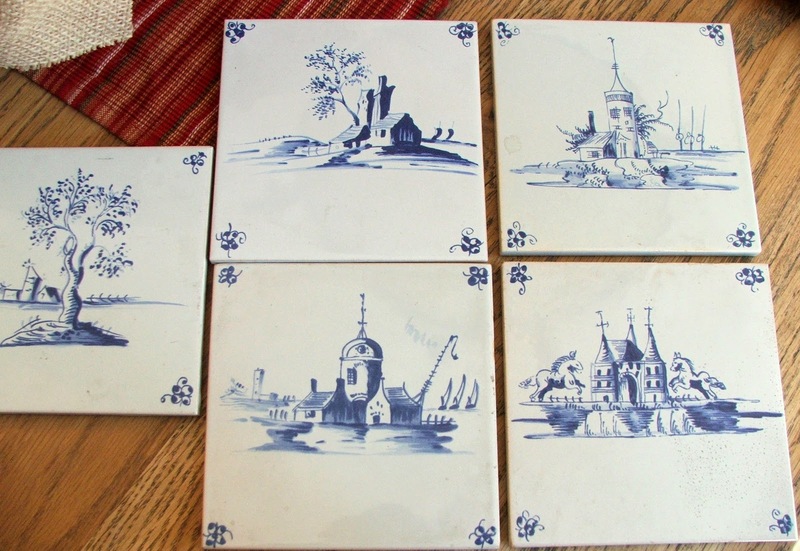 I laid the delft tiles on the scale and all five tiles cost a grand total of 90 cents. Then the cashier looked at my large treasure and said she didn’t need to weigh it and … how about $2.00? I almost peed in my pants!! So you want to see what I got for $2.90? Yes, a gorgeous hand blown demijohn in perfect condition for $2.00!! Wahoo! Hey, maybe I need to frequent the outlet more often. A few days ago I showed you pictures of Antiquing On The Gulf Coast with all the glorious demijohns for sale. I have a very large one I bought years ago at Smith’s Antiques before they became so expensive. I have also collected others at various places and I would have loved to take one of these home from this trip but not at $125 and up. Now I am so glad I didn’t buy one. Here is my new 29″ bottle with a couple others from my collection. Please don’t hate me. I inherited the gene of finding great bargains from my dad. He was an antique dealer and as a child we always went to flea markets, estate sales and garage sales where dad would bring home all these fabulous treasures. Thanks Dad! Thanks for visiting and I love to read your comments. I won't hate you, but I am a little jealous. Nah, I am happy for you actually. The bottle is great. I have been wanting one lately. I bet it will be hard to beat your deal. Wow!!! Fantastic finds. Don't you love coming across something truly grand at a thrift shop. I love antiques and I'm always amazed what people will donate to a Good Will, Salvation Army, or garage sale. However, I suppose it's a wonderful hunt for those of us who appreciate jewels and a good bargain. I love the new tiles. Congrats on your new treasures. PS Goodwill OUTLET stores? Why didn't I know about them??? Off to google…. I didn't even know that Goodwill had outlets…now I'm on a mission to find the nearest one to St. Louis. Thanks! I'm so happy for you! It isn't very often that you fnd something that wonderful or, something that you love at such a great price. Your glassware is very pretty. Sherry, I do hate you!!!!!!!!!!!!! I thought I just got good deals this weekend. 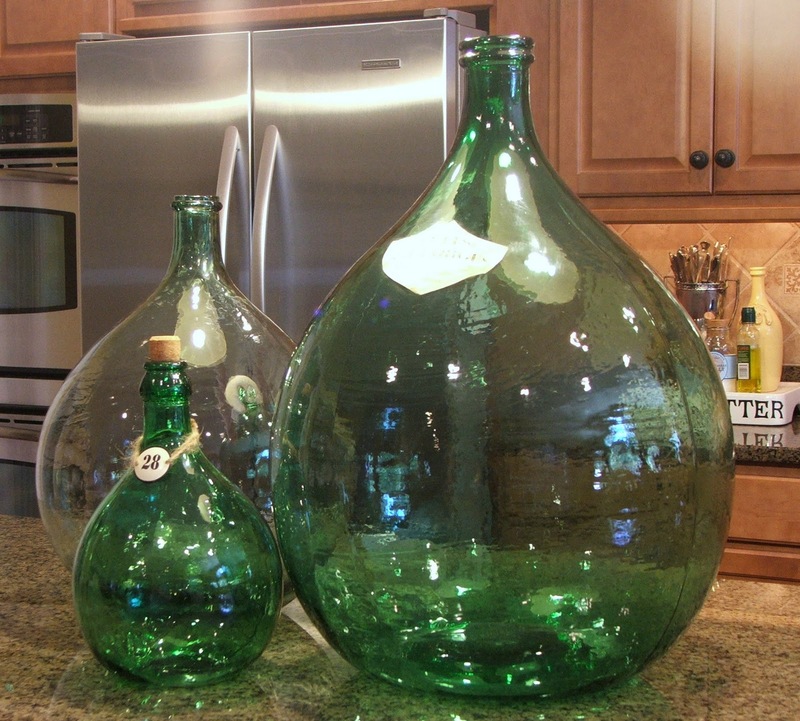 I paide $65 for a green large demijohn and $65 for a huge one with the wicker on it and two more bottles I picked up, too. I will show then when life gets normal again. Okay you know that I am drooling at this very moment…how cool that you found this at a GW outlet store for only $2.00…yes…I very jealous! Hurray for you! Love your great find. I have to admit though that I would have raced you across the store – Ha Ha! No I don't hate you but I am a teeny weenie bit jealous! 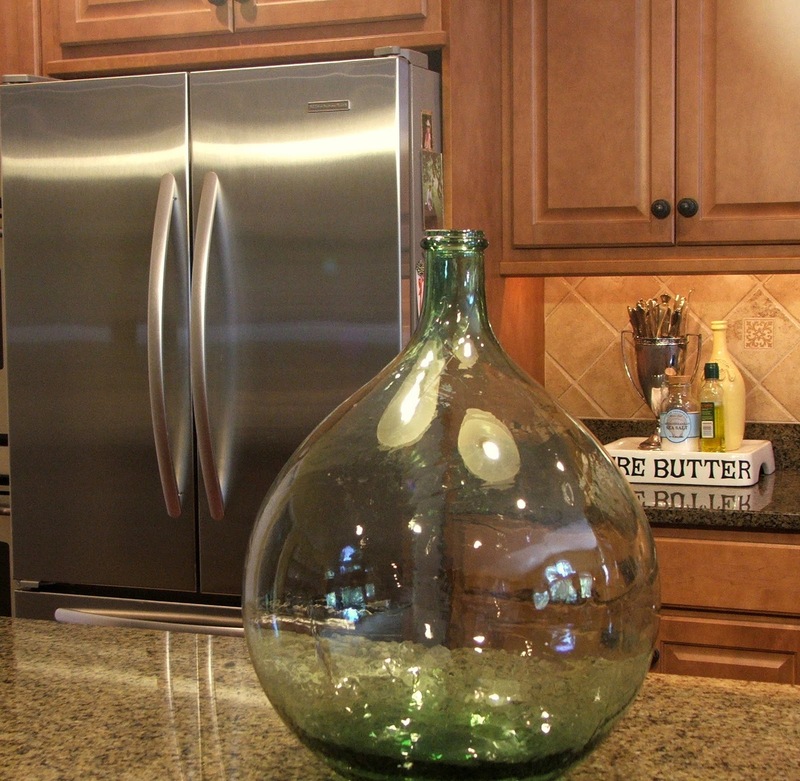 What a gorgeous green color on that demijohn. As if the $25 olive jar wasn't enough. It's too late. I hate you. I paid about $90 for mine and thought that was a decent deal. So, does this lucky streak ever rub off on your shopping companions? If it does, sign me up. You should rename your blog "Shut The Front Door!". Because that's what we all say when we come here. Your post just totally cracked me up!! Congratulations on a wonderful find. It's the best feeling, isn't it? That's how I felt when I found a Francis I sterling silver candy dish at GW for 99 cents, seriously. It was listed on Ebay for $450! Let's keep the good bargain karma going! GW is a great treasure hunting spot. Thanks for sharing your good karma! wow..lucky gal! what a serendipitous find! TFS! And "merci" for all of your lovely comments on my blog. NO,No,No,Not fair!I never see that kind of stuff at G.W. or S.A. How fun for you. Hot dang how that was a great fine. I would have peed my pants too. I don't go to GW often preferring the treasures at the local Salvation Army but I have to admit that is one great bargain and I am totally pea green with envy. You Go Girl! I am so very happy for your finds!! Can I High-Five you through the computer?!!! OMgosh- what a fabulous find!! I love demi-john bottles! I have a huge one (though paid a bit more than your $2;) stored in the attic to make into a barn lamp! Woohoo, what a great score! Hmm, a trip down your way is definitely in my future! Thanks for your sweet comment about my photos! Good for you, Sherry! I see you had a "right place, right time" moment! I have never been to a Goodwill outlet and did not know they even had them. Love the idea of the books though and I'd love to get some to redo at that price myself. That was one awesome find! It is beautiful and I am so happy you found it!! Ok, If I tell you that I love you, will you send it to me? What an amazing buy!!! See it is Karma. You gave away a demijohn and look what you find in return! What a wonderful find, Sherry! It looks fabulous with the others you already had! And your tiles are a great find, too! WOW!!! We have to crown you the bargain diva I think…..I have never scored anything that fabulous in my entire life!!!! LOL..
WOW! Those are great finds! I'd say digging through a few dirty bins is well worth the effort. What a find! The demijohn and the delf tiles were there waiting for you to come and appreicate/rescue them! I was with Kim when she found her treasures and we thought she got a deal. But no one can top you! Goodwill here I come. Thanks for posting my giveaway on your blog and also for joining my blog!!! We too have an outlet near us and like you say it's not for cissy's! Dirty and a lot of digging, but I found one of my most beautiful silver trays there as well as some other great treasures. Guess we're all a little "green" with envy. Do they ever have silver trays there? ? ? That's one of my many weaknesses! HA! Thank you for showing us we all have a human side. . .and not to take ourselves too seriously! Holy Cow, Holy Cow! What a great deal. The tiles too. You really scored. We don't have an outlet like that. Wow!!! Lucky girl! I just love the glass jug! Sherry, You DO have the shopping gene!! What a bargain you found, it's a gorgeous bottle! Thank you for all your sweet comments, I promise I don't have a big head, just a lot of junk I love to move around!!! I TRIED to respond last nite, so HOPE you get this! Ackk! My old computer is ready to go to that Great Microsoft playground in the sky! I'd like to think it would go to a "good home!" The tiles DO remind me of visiting my wonderful Dutch Family! And my "Oma" (the one I got the tin from) was my "mostest favoritist" person in the whole world! So, if you want it,,,,I'd love to send it to someone that would appreciate it!Just email moi. OMG! That is the bargain of the week. Great find. Ok…not hating you…I just want to come and shop with you!!! What a deal!!! It's just too darn bad I didn't beat you to it! Can you say "cat fight"? HA! Lovely finds. You did good! And, you're a sweetheart for adding my button to your sidebar! Wow!! That is a rare find at a Goodwill outlet!! P.S. what a gorgeous kitchen you have. I've heard rumors about those GW outlets, but I don't think they have any around here. I think you got the deals of the century there! Hi Sherry, thanks so much for "following" my blog! I'm thrilled that you found me via Cote de Texas. Now I've discovered your lovely blog. LOVE the title of your blog! So apropos for so many of us. I look forward to "chatting" with you in the future! I don't hate you, but I sure want one of those demijohns and at that price!!! What a find! I'm with you about not venturing into Goodwill very often, but dang girl! You lucked up! They will surprise us sometimes. Wow, good finds. Lucky you! Oh my word Sherry, you found some great things. Those tiles were a great prize! Those finds were fantastic. Love them both. I often skip our Goodwill because it doesn't have much. Thanks for visiting! Some people are just gifted with the know how and when to shop at Goodwill. I no doubt go on the wrong days. I never seem to find these kind of goodies. Wow! That really is such a superb find! I've heard of Goodwill Superstores but never a Goodwill Outlet. I'll have to see if there are any in my area! Congrats on the awesome find! What a fantastic find and great price! Holy cow! You lucky thing! I am so happy for you! What brilliant treasures-enjoy them! I would have bought the tiles, but I don't know anything about demijohns so I probably would have ignored that. It looks much more interesting when it is displayed with the others. If you're willing to dig through broken glass, you deserve a treasure! Happy for you! Well, I feel kinda dumb because I have no idea what a demijohn is or what it was used for. But I can definitely identify with your excitement over your treasure, and it is beautiful, even if I don't know anything about them. Off to wikipedia! Cheers! Wow, this is my first time stublin' across your blog, and I am SO jealous! I love those green bottles. If I had been at that Goodwill, I'd have raced across the store and snapped them up too! You got a fabulous deal! The tiles are beautiful too. I'm not really a blue person, but I would have bought the tiles and figured out somewhere to use them, somehow. Great finds! I'm going to be your newest follower too! OK. You are officially my new Idol! I haven't come across a Good will OUTLET. Hopefully I will at some point. Thanks for sharing! As soon as I saw the thumbnail of your demijohn at Debra's I rushed right over. You better be careful you don't end up on the Post Office wall as "most wanted" for steal of the day! Wow, Wow, Wow, what a find. Yup, you should go to that Goodwill store more often. One never knows what one might find. You just proved that. Congrats on the fantastic find. You are a lucky lady indeed!! You've started a new addiction for me… I need to find some demijohns for my house now!! Thanks!! Great finds! I have been thrifting a lot lately in hopes of having a somewhat recycled Christmas this year! Such a treasure hunt! I LOVE the local Goodwill outlet. Yes, you do have to go preparred for a little skankiness but there are some great treasures to be had for sure! High five!!! No hating here, its a great find but it would last about three seconds in this house! TFS. This is great, thanks so much for linking up! I don't hate you, but I want to shop with you. I am jealous! My GW never has specials and smells so bad, I can't wait to get out of there! WONDERFUL!!!! I am impressed, woman! !